Judo, meaning "gentle way", is a modern Japanese martial art (gendai budō) and combat sport, that originated in Japan in the late nineteenth century. Its most prominent feature is its competitive element, where the object is to either throw one's opponent to the ground, immobilize or otherwise subdue one's opponent with a grappling maneuver, or force an opponent to submit by joint locking the elbow or by applying a choke. Strikes and thrusts (by hands and feet) - as well as weapons defences - are a part of judo, but only in pre-arranged forms (kata) and are not allowed in judo competition or free practice (randori). Ultimately, the philosophy and subsequent pedagogy developed for judo became the model for almost all modern Japanese martial arts that developed from "traditional" schools (koryū). Practitioners of judo are called jūdōka. The early history of judo is inseparable from its founder, Japanese polymath and educator Jigoro Kano (1860–1938). Kano was born into a well-to-do Japanese family. His grandfather was a self-made man: a sake brewer from Shiga prefecture in central Japan. However, Kano's father was not the eldest son and therefore did not inherit the business. Instead, he became a Shinto priest and government official, with enough influence for his son to enter the second incoming class of Tokyo Imperial University. Cian was a small, frail boy, who, even in his twenties, did not weigh more than a hundred pounds (45 kg), and was often picked on by bullies. He first started pursuing jujutsu, at that time a dying art, at the age of 17, but met with little success. This was in part due to difficulties finding a teacher who would take him on as a student. When he went to university to study literature at the age of 18, he continued his martial arts studies, eventually gaining a referral to Fukuda Hachinosuke (c.1828–c.1880), a master of the Tenjin Shin'yō-ryū and grandfather of Keiko Fukuda (born 1913), who is Kano's only surviving student, and the highest-ranking female jūdōka in the world. 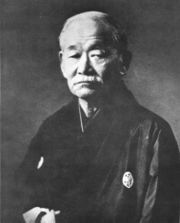 Fukuda Hachinosuke is said to have emphasized technique over formal exercise, sowing the seeds of Kano's emphasis of free practice (randori) in judo. A little more than a year after Kano joined Fukuda's school, Fukuda became ill and died. Kano then became a student in another Tenjin Shin'yō-ryū school, that of Iso Masatomo (c.1820–c.1881), who put more emphasis on the practice of pre-arranged forms (kata) than Fukuda had. Through dedication, Kano quickly earned the title of master instructor (shihan) and became assistant instructor to Iso at the age of 21. Unfortunately, Iso soon took ill, and Kano, feeling that he still had much to learn, took up another style, becoming a student of Iikubo Tsunetoshi (1835–1889) of Kitō-ryū. Like Fukuda, Iikubo placed much emphasis on free practice. On the other hand, Kitō-ryū emphasized throwing techniques to a much greater degree than Tenjin Shin'yō-ryū. By this time, Kano was devising new techniques, such as the "shoulder wheel" (kata-guruma, known as a fireman's carry to Western wrestlers who use a slightly different form of this technique) and the "floating hip" (uki goshi) throw. However, he was already thinking about doing far more than just expanding the canons of Kitō-ryū and Tenjin Shin'yō-ryū. Full of new ideas, Kano had in mind a major reformation of jujutsu, with techniques based on sound scientific principles, and with focus on development of the body, mind and character of young men in addition to development of martial prowess. At the age of 22, when he was just about to finish his degree at the University, Kano took nine students from Iikubo's school to study jujutsu under him at the Eisho-ji, a Buddhist temple in Kamakura, and Iikubo came to the temple three days a week to help teach. Although two years would pass before the temple would be called by the name "Kodokan", or "place for teaching the way", and Kano had not yet been accorded the title of "master" in the Kitō-ryū, this is now regarded as the Kodokan's founding. Judo was originally known as Kano Jiu-Jitsu or Kano Jiu-Do, and later as Kodokan Jiu-Do or simply Jiu-Do or Judo. In the early days, it was also still referred to generically simply as Jiu-Jitsu. The word "judo" shares the same root ideogram as "jujutsu": "jū" (柔, "jū"), which may mean "gentleness", "softness", "suppleness", and even "easy", depending on its context. Such attempts to translate jū are deceptive, however. The use of jū in each of these words is an explicit reference to the martial arts principle of the "soft method" (柔法, jūhō). The soft method is characterized by the indirect application of force to defeat an opponent. More specifically, it is the principle of using one's opponent's strength against him and adapting well to changing circumstances. For example, if the attacker was to push against his opponent he would find his opponent stepping to the side and allowing his momentum (often with the aid of a foot to trip him up) to throw him forwards (the inverse being true for pulling.) Kano saw jujutsu as a disconnected bag of tricks, and sought to unify it according to a principle, which he found in the notion of "maximum efficiency". Jujutsu techniques that relied solely on superior strength were discarded or adapted in favour of those that involved redirecting the opponent's force, off-balancing the opponent, or making use of superior leverage. The second characters of judo and jujutsu differ. Where jujutsu (jūjutsu) means the "art" or "science" of softness, judo (柔道, jūdō) means the "way" of softness. The use of "dō", meaning way, road or path (and is the same character as the Chinese word "tao"), has philosophical overtones. This is the same distinction as is made between Budō and Bujutsu. Use of this word is a deliberate departure from ancient martial arts, whose sole purpose was for killing. Kano saw judo as a means for governing and improving oneself physically, mentally, emotionally and morally. He even extended the physical principle of maximum efficiency into daily life, evolving it into "mutual prosperity". In this respect, judo is seen as a holistic approach to life extending well beyond the confines of the dojo. A practitioner of judo is known as a judoka or 'judo player', though traditionally only those of 4th Dan or higher were called "judoka". The suffix -ka, when added to a noun, means a person with expertise or special knowledge on that subject. For example, Benkyo-ka means "scholar". Other practitioners below the rank of 4th dan were called kenkyu-sei or "trainees". However, today the term judoka is used worldwide to refer to any practitioner of judo without any particular level of expertise being implied. A judo teacher is called sensei. The word sensei comes from sen or saki (before) and sei (life) – i.e. one who has preceded you. In Western dojos it is common to call any instructor of dan grade sensei. Traditionally, that title was reserved for instructors of 4th dan and above. Judo practitioners traditionally wear white uniforms called jūdōgi, which simply means "judo uniform", for practicing judo. Sometimes the word is seen shortened simply to gi (uniform). The jūdōgi was created by Kano in 1907, and similar uniforms were later adopted by many other martial arts. The modern jūdōgi consists of white or blue cotton drawstring pants and a matching white or blue quilted cotton jacket, fastened by a belt (obi). The belt is usually coloured to indicate rank. The jacket is intended to withstand the stresses of grappling, and as a result, is much thicker than that of a karate uniform (karategi). The modern use of the blue judogi was first suggested by Anton Geesink at the 1986 Maastricht IJF DC Meeting. 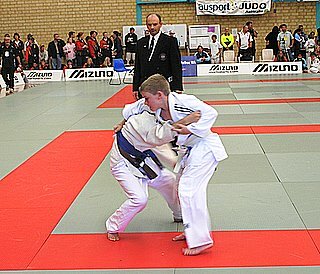 For competition, a blue jūdōgi is worn by one of the two competitors for ease of distinction by judges, referees, and spectators. In Japan, both judoka still use a white judogi and the traditional red sash (based on the colours of the Japanese flag) is affixed to the belt of one competitor. 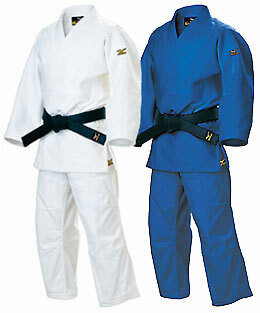 Outside Japan, a coloured sash may also be used for convenience in minor competitions, the blue jūdōgi only being mandatory at the regional or higher levels. Japanese practitioners and purists tend to look down on the use of blue jūdōgi. While judo includes a variety of rolls, falls, throws, hold downs, chokes, joint-locks, and strikes, the primary focus is on throwing (nage-waza), and groundwork (ne-waza). Throws are divided in two groups of techniques, standing techniques (tachi-waza), and sacrifice techniques (sutemi-waza). Standing techniques are further divided into hand techniques (te-waza), hip techniques (koshi-waza), and foot and leg techniques (ashi-waza). Sacrifice techniques are divided into those in which the thrower falls directly backwards (ma-sutemi-waza), and those in which he falls onto his side (yoko-sutemi-waza). Judo emphasizes a free-style sparring, called randori, as one of its main forms of training. 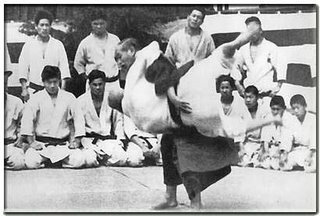 Part of the combat time is spent sparring standing up, called tachi-waza, and the other part on the ground, called ne-waza. Sparring, even subject to safety rules, is much more practically effective than only practicing techniques on their own, which is what jujutsuka were used to doing. Using full strength develops the muscles and cardio-vascular system on the physical side of things, and it develops strategy and reaction time on the mental side of things, and helps the practitioner learn to use techniques against a resisting opponent. A common saying among judoka is "The best training for judo is judo." In judo, there are two main phases of combat: the standing (tachi-waza) and the ground (ne-waza) phase. Each phase requires its own (mostly separate) techniques, strategies, randori, conditioning and so on. Special training is also devoted to "transitional" techniques to bridge the gap. Jūdōka may become quite skilled in one phase and be rather weak in the other, depending on where their interests most lie, although most are balanced between the two. Judo's balance between both the standing and ground phases of combat gives judoka the ability to take down opponents who are standing up and then pin and submit them on the ground. This balanced theory of combat has made judo a popular choice of martial art or combat sport. In the standing phase, which has primacy according to the contest rules, the opponents attempt to throw each other. Although standing joint-lock and choke/strangulation submission techniques are legal in the standing phase, they are quite rare due to the fact that they are much harder to apply standing than throws are. Some jūdōka, however, are very skilled in combining takedowns with submissions, where a submission technique is begun standing and finished on the ground. Strikes (i.e. punches, kicks, etc...) are not allowed due to their certainty of injury, but an athlete is supposed to "take them into consideration" while training by, for example, not fighting in a bent-over position for long, since this position is vulnerable to knee-strikes and other striking attacks. The main purpose of the throwing techniques (nage waza) is to take an opponent who is standing on his feet, mobile and dangerous, down onto his back where he cannot move as effectively. Thus, the main reason for throwing the opponent is to control the opponent and to put oneself in a dominant position. In this way the practitioner has more potential to render a decisive outcome. Another reason to throw the opponent is to shock his body through smashing him forcefully onto the ground. If an opponent executes a powerful yet fully controlled throw, he can win a match outright (by ippon) on the basis that he has displayed sufficient superiority. A lower score is given for lesser throws. A score for a throw is only given when executed starting from a standing position. In keeping with Kano's emphasis on scientific analysis and reasoning, the standard Kodokan judo pedagogy dictates that any throwing technique is theoretically a four phased event: off-balancing (kuzushi); body positioning (tsukuri); execution (kake); and finally the finish or coup de grâce (kime). Each phase follows the previous one with great rapidity - ideally they happen almost simultaneously. In competition, combat may continue on the ground after a throw occurs or if the contestants otherwise legally end up on the ground; a contestant is not allowed to simply drop to the ground to commence ground fighting. Hold downs ( osaekomi) are important since in a real fight the person who has control of his opponent can hit him with punches, knees, headbutts, and other strikes. If osaekomi is maintained for twenty-five seconds, the person doing the holding down wins the match. An osaekomi involves holding an opponent principally on their back, and free of their legs. According to the rules as they stood in 1905, it was only necessary to hold down an opponent, on his shoulders, for two seconds - said to reflect the time necessary for a samurai to reach his knife or sword and dispatch his held opponent. The newer longer requirements reflect the combat reality that a fighter must immobilize his opponent for a substantial amount of time in order to strike effectively. The score for a hold down is determined by how long the hold down is held. A hold down may sometimes result in a submission if the opponent cannot endure the pressure from the hold down. If the person being held down has wrapped his legs around any part of his opponent's lower body or trunk, he is pinning his opponent as much as he is being pinned, because his opponent cannot get up and flee unless the person on the bottom lets go. While his legs are wrapped around his opponent, the person on the bottom can employ various attacking techniques, including strangles, armlocks and "body scissors" (do-jime), while controlling the opponent so that he cannot effectively strike from above. In this position, often referred to as the "guard" in English, the person on top does not have enough control over his adversary for the position to be considered osaekomi. (Note that while the guard is commonly used, do-jime is no longer legal in competition judo.) The person on top can try to pass his opponent's legs and in turn hold down or submit him, or he may try to break out of his opponent's guard and stand up. The person on the bottom can try to submit his opponent from his guard or roll his opponent over to get on top of him. Joint locks (kansetsu-waza) are effective combat techniques because they enable a jūdōka to control his opponent through pain-compliance. Joint locks on the elbow are considered safe enough to perform at nearly full-force in competition to force submission from one's opponent. Judo has, in the past, allowed leglocks, wristlocks, spinal locks and various other techniques that have since been disallowed in competition to protect athletes' safety. It was decided that attacking those other joints would result in many injuries to the athletes and would cause a gradual deterioration of these joints. Even so, some jūdōka still enjoy learning and fighting each other informally using these techniques that are banned from formal competitions, and many of these techniques are still actively used in other arts such as sambo, Brazilian Jiu-Jitsu, and jujutsu. Chokes and strangulations (shime-waza) enable the one applying the choke to force the adversary to submit. Strangulation cuts off the blood supply to the brain via compression on the sides of the neck, while a choke blocks the airway from the front of the neck. The terms are frequently interchangeable in common usage, and a formal differentiation is not made by most jūdōka. In competition, the jūdōka wins if the opponent submits or becomes unconscious. A strangle, once properly locked in, can render an opponent unconscious in only a few seconds, but normally causes no injury. Although a fully featured martial art, judo has also developed as a sport. The first time judo was seen in the Olympics was at the 1932 Games in Los Angeles, where Kano and about 200 judo students gave a demonstration. Judo became an Olympic sport for men in the 1964 Games in Tokyo. With the persistence of Rusty Kanokogi, an American, and many others, judo became an Olympic sport for women as well in 1988. It is often stated that the men's judo event in 1964 was a demonstration event, but according to the International Judo Federation (IJF) and International Olympic Committee, Judo was in fact an official sport in the 1964 games. Dutchman Anton Geesink won the first Olympic gold medal in the open division of Judo by defeating Aiko Kaminaga of Japan. Judo then lost the image of being "Japanese only" and went on to become one of the most widely practised sports in the world. The women's event was a demonstration event in 1988, and became an official medal event 4 years later. Men and women compete separately, although they often train together. Judo has been a Paralympic sport (for the visually impaired) since 1988. Judo is also one of the sports at the Special Olympics. The traditional rules of judo are intended to avoid injuries to the participants and ensure proper etiquette. Some later additions to the rules were motivated by a desire to make the sport more interesting to observers. Penalties may be given for being inactive during the match, or for using illegal techniques. Fighting must be stopped if a participant is outside the designated area on the mat (tatami). If the referee and judges need to discuss something during groundwork, the referee will call sonomama (which means "do not move") and both fighters must stop in the position they are in. When they are done, the referee says yoshi and the match continues. All scores and penalties are given by the referee. The judges can make a decision that changes the score or penalty given by the referee. There are slight differences to IJF rules to accommodate blind judo. The object in a judo match is to throw the opponent to the ground on his shoulder; to pin him to the ground principally on his back; or to force him to submit to a choke, strangle or an armlock. Any of these score ippon, immediately winning the match. Judo has four grades of score: ippon, waza-ari, yuko, and koka. An ippon literally means "one point" and wins the match. An ippon is awarded for (a) a throw that lands the opponent largely on their back in a controlled manner with speed and force; (b) for a mat hold of sufficient duration (twenty five seconds); or (c) for opponent submission. A waza-ari is awarded for a throw that does not quite have enough power or control to be considered ippon; or for a hold of twenty seconds. A waza-ari is a half-point, and, if two are scored, they constitute the full point needed for a win. Yuko and koka are lower grades of score, and only count as tie-breakers - they are not cumulative with one another. Scoring is lexicographic; a waza-ari beats any number of yuko, but a waza-ari and a yuko beat a waza-ari with no yuko. It is not uncommon for a match to be decided based on koka. A fifteen-second hold down scores yuko and a ten-second hold down scores koka. If the person who secured the hold down already has a waza-ari, they only need to hold the hold down for twenty seconds to score ippon by way of two waza-ari (waza-ari-awasete-ippon). Throws further lacking the requirements of an ippon or a waza-ari might score a yuko or a koka. So-called "skillful takedowns" are also permitted (e.g. the flying arm-bar) but do not score. If the scores are identical at the end of the match, the contest is resolved by the Golden Score rule. Golden Score is a sudden death situation where the clock is reset to match-time, and the first contestant to achieve any score wins. If there is no score during this period, then the winner is decided by Hantei, the majority opinion of the referee and the two corner judges. Judo scoreboards show the number of waza-ari, yuko and koka scores scored by each player. Often an ippon is not represented on the scoreboard, because upon award of an ippon the match is immediately terminated. Some computerised scoreboards will briefly indicate that an ippon has been scored. Electronic scoreboards also usually include timers for measuring both competition time and osekomi time. A match with the first player scoring one waza-ari, two yuko, and two koka, beating his opponent who scored one fewer kokas would be displayed on the scoreboard as: "122" vs. "121"; while in print such a result would often be represented as: "1W2Y2K" vs. "1W2Y1K". In 1902, Barton-Wright wrote: "Judo and jujitsu were not designed as primary means of attack and defence against a boxer or a man who kicks you, but were only to be used after coming to close quarters, and in order to get to close quarters it was absolutely necessary to understand boxing and the use of the foot." Furthermore, ground grappling had been proven to be an effective form of self-defence. Using their knowledge of ne-waza/grappling and tachi-waza/standing-grappling, accomplished judo practitioners have also competed in mixed martial arts matches. Former Russian national judo champion Fedor Emelianenko is usually ranked as mixed martial arts' best heavyweight. Karo Parisyan fights in UFC's welterweight division, and Rameau Thierry Sokoudjou and Hidehiko Yoshida, an Olympic gold medalist in 1992 and World Judo Champion in 1999, were also fighters in the now defunct PRIDE FC. Other Olympic gold medalist and world champion judokas such as Pawel Nastula, Yoon Dong-Sik and Jung Bu-Kyung also fight in MMA. Undefeated WEC middleweight champion Paulo Filho has credited judo and jiu-jitsu for his success. Fighters Sanae Kikuta and Hayato Sakurai also come from judo backgrounds. Olympic Judo: This is the predominant form of Kodokan judo. Brazilian Jiu-Jitsu: Mitsuyo Maeda introduced judo to Brazil in 1914. Maeda taught judo to Carlos Gracie (1902–1994) and others in Brazil. Brazilian Jiu-Jitsu did not follow later changes in international judo rules that were added to emphasise the standing phase of the fight, nor those rules that were introduced to ban the more dangerous techniques. Although all the techniques are virtually the same, BJJ's quite different point scoring system and absence of judo's various rules that require the competitors to recommence fighting from a standing position are largely responsible for giving it its different character. BJJ is closer to the original early 1900s judo than current Olympic judo is. Judo-do: In Austria, Julius Fleck and others developed a system of throwing intended to extend judo that they called "judo-do". Kawaishi-ryū jujutsu: Teaching in France, Mikonosuke Kawaishi developed Kawaishi-ryū jujutsu as an alternative approach to instruction that continued to teach many techniques banned in modern Olympic/Kodokan judo competition. Kosen Judo: As a sub-style of Kodokan Judo that became popularised in early 20th century Japanese inter-scholastic competition, Kosen style has the same range of techniques but greater latitude is permitted for ground technique. Like BJJ, this style of judo is closer to the original early 1900s judo than current Olympic judo is. Russian Judo: This distinctive style of judo was influenced by Sambo. It is represented by well-known coaches such as Alexander Retuinskih and Igor Yakimov, and mixed martial arts fighters such as Igor Zinoviev, Fedor Emelianenko and Karo Parisyan. In turn, Russian judo has influenced mainstream judo, with techniques such as the flying armbar being accepted into Kodokan judo. Sambo (especially Sport Sambo): Vasili Oshchepkov was the first European judo black belt under Kano. Oshchepkov went on to create Sambo from judo's influence, integrating other combative techniques into his new system. Oshchepkov died during the political purges of 1937 for refusing to deny his education in Japanese judo under Kano. In their History of Sambo, Brett Jacques and Scott Anderson wrote that in Russia "judo and SOMBO were considered to be the same thing" - albeit with a different uniform and some differences in the rules. Research shows that judo is a particularly safe sport for youths, though adult competitive judo has a relatively higher incidence of injuries compared to non-collision or non-contact ball-sports for example, but similar to other competitive contact sports. Although chokes are potentially lethal techniques, a properly-applied chokehold, if released soon enough after submission or unconsciousness, causes no injury. The international organization for judo is the International Judo Federation (IJF). Although it has no official standing in judo, the International Federation of Associated Wrestling Styles (FILA) defines judo as one of the four main forms of amateur competitive wrestling practised internationally (the other three being Greco-Roman wrestling, Freestyle wrestling and sambo). Jūdōka are ranked according to skill and knowledge of judo, and their rank is reflected by their belt colour. There are two divisions of rank: below-black-belt-level "grades" (kyū), and black-belt-level "degrees" (dan). This ranking system was introduced into the martial arts by Kano and has since been widely adopted by modern martial arts. As initially designed, there were six student grades ranked in descending numerical order, with 1st kyū being the last before promotion to first degree black belt (shodan). There are ordinarily 10 dan ranks, which are ranked in ascending numerical order, though in principle there is no limit to the number of dan ranks. Although dan ranks tend to be consistent between national organisations there is more variation in the kyū grades, with some countries having more kyū grades. Although initially kyū grade belt colours were uniformly white, today a variety of colours are used. In Japan, the use of belt colours is related to the age of the student. Some clubs will only have black and white, others will include a brown belt for advanced kyū grades and at the elementary school level it is common to see a green belt for intermediate levels. For dan ranks, the first five are coloured black, 6th, 7th, and 8th dan have alternating red and white panels, and for 9th and 10th dan the belts are solid red. However, holders of grades above godan (5th dan) will often wear a plain black belt in regular training. Some countries also use colored tips on belts, to indicate junior age groups. Historically, women's belts had a white stripe along the centre. Examination requirements vary depending on country, age group and of course the grade being attempted. The examination itself may include competition and kata. The kyū ranks are normally awarded by local instructors (sensei), but dan ranks are usually awarded only after an exam supervised by independent judges from a national judo association. For a rank to be recognized, it must be registered with the national judo organization or the Kodokan. Please refer to the attached registration age versus grade for further information as to the current belt colours and grades. For Australia and most of Europe, the belt colours in ascending order are white, red, yellow, orange, green, blue, brown and finally black. Some European countries additionally use a red belt to signify a complete beginner, whereas other European countries such as the UK use a red belt as the belt one grade above a beginner to show that the person is a full member of a club. This article is licensed under the GNU Free Documentation License. It uses material from the Wikipedia article "Judo".